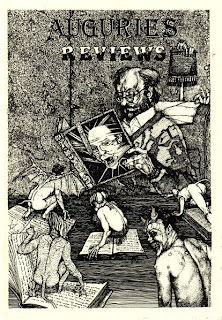 Auguries Review Magazine No.4 – 22 pages, new cover illo by Russell Morgan; interior illustrations by Paul Cockburn from ‘Companions’ in the magazine. Annoyingly, I didn’t have room in the main magazine to credit the artists so the credits went into the review magazine. The gap between this and the previous issue was so immense that no letters were featured. The editorial went into the review magazine and talked of bringing out #19 – but it never happened. As many small press publishers found, the cost of printing and paper kept going up so that any attempt at breaking even – which never happened with Auguries – was nigh impossible. Most editors/publishers do the job because they enjoy it and love their work – often in their spare time since they have a day-job to subsidise the magazine. Finding time – when I was also studying for OU, going to sea – meant that self-imposed deadlines were frequently missed. The stark reality of being made redundant twice, combined with increased costs – and a backlog of typed stories, not electronic versions – mitigated against my continuing. Until the bitter end I truly believed I could bring out more issues of Auguries; I’ve still got that stockpile of short stories, though probably many contributors would no longer thank me for publishing their stories since they’ve probably moved on and improved. I should have faced reality much sooner and returned the stories unused but regrettably that didn't happen.